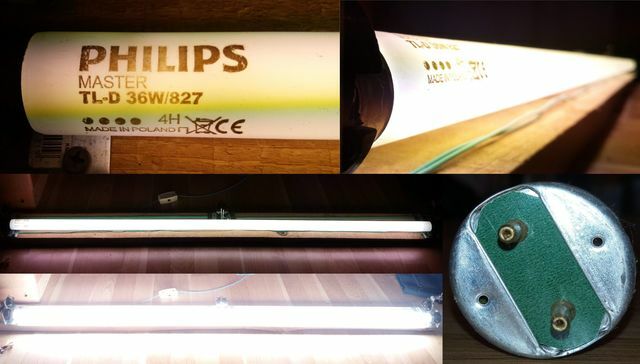 Lighting-Gallery-net - fluorescent tubes T8/T12/Philips Master TLD F27 F36T8 fluorescent tube, the twin sister of Holland Philips Master, made in Polland. Philips Master TLD F27 F36T8 fluorescent tube, the twin sister of Holland Philips Master, made in Polland. The practically same tube, the etch, the construction, cathodes, end brightness and color temperature are identical. Two differences: The Holland-ese one has the etch with blank space and it says "Made In Holland" and on Poland-ese one in the blank space there are four large ink dots and it says "Made In Poland"
Nope, not really same. Holland factory (Roosendaal) doesn't exist anymore. Now a day all lamps are produced in Poland, probably with old producion line from Roosendaal factory. There are identical TL-D and F series lamps who are having same date code and same factory. These are identical. Date code 4H (Okt-2014) and B7 (Feb-2007) makes a big difference..